Selfie lo, Zara vouchers Jeeto! 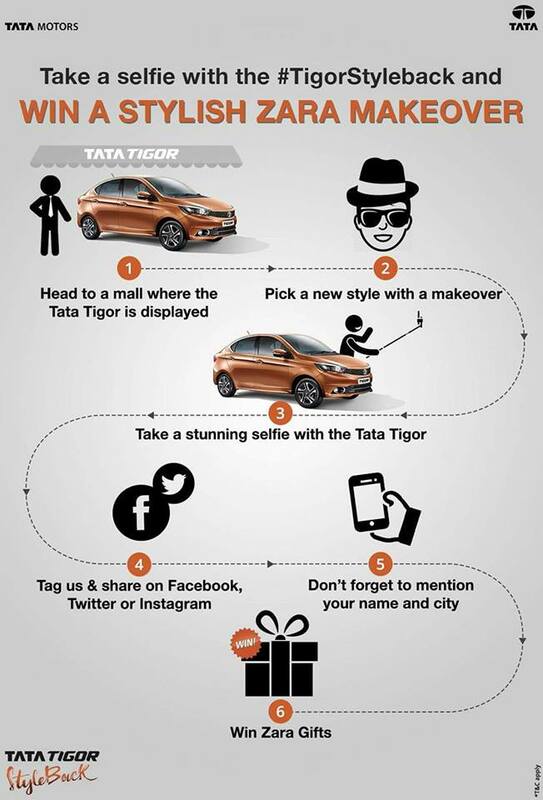 Sound interesting, if yes then start learning selfie clicking right away as there is a big contest by @TataMotors presenting #TigorStyleback that is Selfie With Tata Tiago! In this contest, you have to go to mall mentioned in terms and conditions of Tata Motors official pages according to your city for Mumbaikars, you have Viviana Mall left as R city has already done with it on 3rd and 4th June. Mark that this is promotional offer is valid on display vehicle at the below mentioned at the mall activation locations only. Once the person gives his or her consent they get styled with the goodies available at the location, to click selfies. You can participate on all three platforms which are Facebook, Twitter, Instagram and tag with the hashtag as #TigorStyleback. The participant must upload the selfie picture between 12.01 AM to 23.59 PM along with the name and city they are participating from there are total 5 winners from each mall, so guys go and click selfie right away. All the Winners of the will receive a Zara styling voucher as a gift by Tata Motors Ltd. So friends don’t wait and watch, run and go and click a selfie with Tata Tiago. It’s a golden opportunity to showcase your selfie talent and make the most out of it and I must say after winning this contest you will fall in love with the surprise prize you will be receiving. So, let’s Pout, Click and Post!! FOR MORE INFORMATION Follow the image below. Follow This Simple Steps and Winsome!